Back into it and back on the roads & beach. It was great to get back onto my feet and walking after a weeks paddling on the river but I’d already forgotten how heavy a freshly resupplied pack with water was. I had a feeling that it would be dry camping tonight so I was carrying 2.5 litres of water as well as 2.5 days food. But it didn’t take long to get back into the swing of things. It was an uneventful day really with basically just road walking and a short 7 km section of beach from Koitiata before hitting the pines and forestry roads of the Stantof Forest. Today was a day of head down, ipod in listening to podcasts and one of keeping the feet moving. It has been such a long time since walking on a beach too that I’d forgotten how hard it was on the feet in soft sand with an incoming tide. Koitiata struck me as Marlo in New Zealand. Similar sized beach side town full of holiday markers for the Christmas/New Year holiday period. Shout out to all my Marlo friends dealing with the annual inundation of tourists. 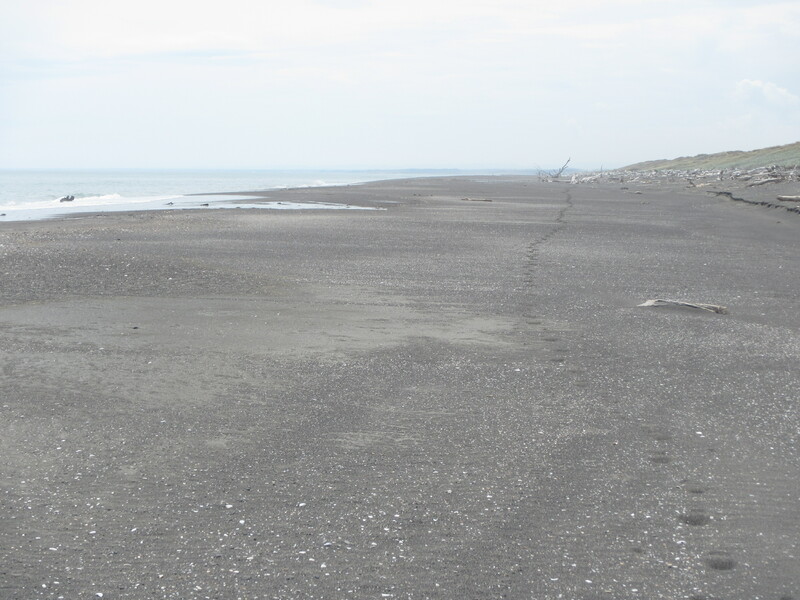 The black sands of Koitiata were in stark contrast to all the other beaches walked thus far with quartz white sands. Sun bleached skeletons of trees littered the entire beach and it looked like the exposed bones and thousands of dinosaurs. What really amazed me along the beach was the number of people stopping me to ask where I was headed and why. Not a single one of them had heard of Te Araroa. They all thought I was crazy. It was as if walking more than 200 m for anything for them was the stupidist thing ever. I got sick of comments like “We have buses you know!”, “Why would you want to do that?”. I just kept reminding myself that these are typical city folk out for their annual summer vacation to the same spot they’ve been visiting for the last 20 years and too caught up in the comfot of their own micro world; not at all typical of all the other amazing locals I’ve met right along the way. Towards the end and after countless short conversations repeating the same answers I started to get a little annoyed and started to cut people off with statements like ” If you have to ask the question, you will never understand why I’m doing this” and walked on. The sun was out in force today too which made for hot going and frequent breaks. 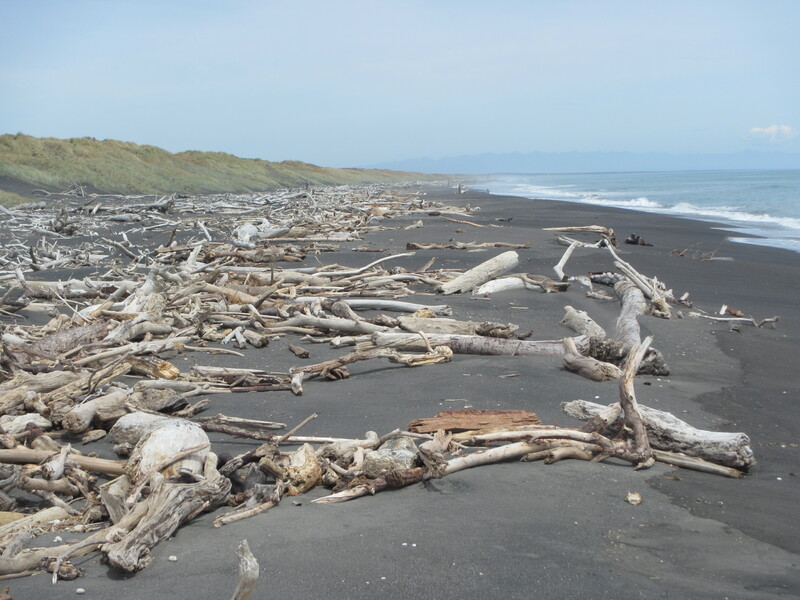 Sun screen applied liberally to my pale skin immediately collected any black sand that was blown up by the winds. It was great to have a quick swim at the end of the beach to cool down and wash off a bit before heading inland again. The days was getting on and I started to ration my water, knowing that I still had a way to go before reaching a camp site, and would need enough for the night and morning if sleeping out. Luckly I topped up before the beach. I got more distance in than I ever thought I would but finally pulled up stumps arpund 6:30pm to settle into a sheltered spot amongst the cover of pines near the TA 1420 km mark, exhausted. A thick cover of pine needles on the forest floor providing a nice cushioned camp for the night and the trees overhead providing some shelter from the rain that was expected to commence overnight and hang around for a few days. hey Mick, right back at u from Marlo 🙂 Marathon man today. good job.